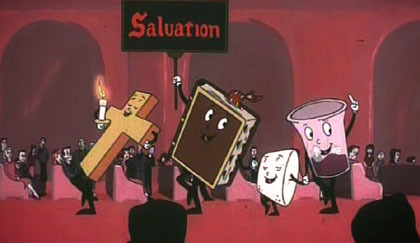 Christians are told that they must believe the salvation story of the bible or be damned. The threat is often put in such threatening, frightening words and images that the fear of a mistake is pushed very, very deep. Many people suffer constant, life-long anxiety for their occasional doubts. I don’t have this fear, and perhaps my reasons for that can help someone else. And so I offer the following. How could it make sense to punish me with eternal torment because the bible and preachers were unable to convince me of something? Is it really my fault that they made a weak case? Maybe their case was good enough for some, but I found it unconvincing. After all, no Jesus or god appeared before me to prove their case. All I ever got, to base a decision on, were the words of the bible, and its interpreters and promoters. I never saw any direct – in this world - evidence. I got no more evidence for the salvation story than I got for the divinity of Mohammed. A claim in a book, that’s all. So I believe in neither. And you’re already halfway to my position. If a philosopher fails to convince a reader of the correctness of his theory, is it the reader’s fault? If you tell me a story full of miracles (scientific impossibilities, by definition) and I can’t believe your story, should I really be blamed? Should I be punished? If I told you that I saw two cows flying over my neighbor’s house last week, should I blame you for not believing it? It seems to me that the burden of proof is on the one making the claim. To punish me (or you) for someone else’s failure to make a convincing case is absurd. I refuse to take responsibility for another’s failings, and I cannot believe a sensible god would fault me for this. Some of the faithful would argue that I have “hardened my heart,” and that is why I cannot believe in the salvation story. But how would that be possible? How does one simply decide he is not going to believe something, if it is true, and there is at least some evidence? Could I just decide that the sun is not warm? If the evidence is before me, and it is convincing, like the heat on my face on a sunny summer day, how could I deny the fact? And even if I could, why would I gamble my life? I am of sound mind. If I thought there was even the slightest chance that the salvation story was true, I would want to do everything I could to ensure my salvation. Only a fool or an idiot would do otherwise and risk eternal pain. No, I have not hardened my heart; I don’t know how to do that, and, anyway, the stakes are far too high. If we think about this a bit, shouldn’t we be suspicious when someone tells us that we just have to take their word for something? Doesn’t that make the claimant sound just a trifle desperate? Doesn’t that suggest he may be trying to “sell us a bridge?” The bible doesn’t tell us how we can be sure that we can live forever, it only tells us that we must believe it. That is a key point. But, if the bible told us how we can be sure this claim is true, then we WOULD believe it. We wouldn’t need to be told that we MUST believe it. If the bible really provided the proof, then no one would doubt it, and the bible would not demand that we believe it. Shouldn’t we be suspicious when someone tells us that we just have to take their word for something? Do you begin to see why I have very serious reservations about this salvation claim the bible makes? The bible doesn’t tell me how I can know that it’s true, it doesn’t prove it; it merely tells me I must believe it. Sorry, but that just makes me suspicious. It sure looks to me like the guys who wrote this stuff didn’t know for sure, and that fact is shown in the way they wrote about it. Their claims are simply not convincing to me. How cruel and insensitive would a god have to be to allow me to miss out on an eternity in the bliss of heaven, just because his spokesmen made a weak, unconvincing case? Do you think I would deserve such a punishment? If you were on the jury, could you say, “Guilty,” knowing what my sentence would be? Could your god be less understanding and compassionate than you, do you think? Consider for a moment that it’s the use of our brains, our power of reason, which saves us from being sucked into the schemes of religious scammers like Jim Jones (Guyana), David Koresh (Waco, TX. ), and Mohammed. That can’t be a bad thing. I don’t believe the salvation story of the bible (there are actually several). There are just too many inconsistencies and miracles in it, and too little evidence for us to examine today. And you don’t have to believe it either. No god worthy of the name could fault either of us for doubting a poorly argued claim; that’s what our brains are for, after all.